Search engine content marketing, positions your content in the top rankings of search engines such as Google, Bing, and Yahoo. From the beginning phases of development, we optimize your site and content so your keyword gets your content to the right target audience. Search engine optimization techniques are one of our specialties and are highly recommended. If you neglect the search engine optimization aspect of the Internet process, it would be the equivalent to putting your storefront in the middle of the desert. We are excited that you have chosen to verify our proof. Please take a moment to look through our live results below. The Network Gurus have a site we manage. While they enjoy they competitive edge of holding several local keyword phrases pertaining to their niche market, we have chosen to share some of the Gurus verifiable top thirty results. 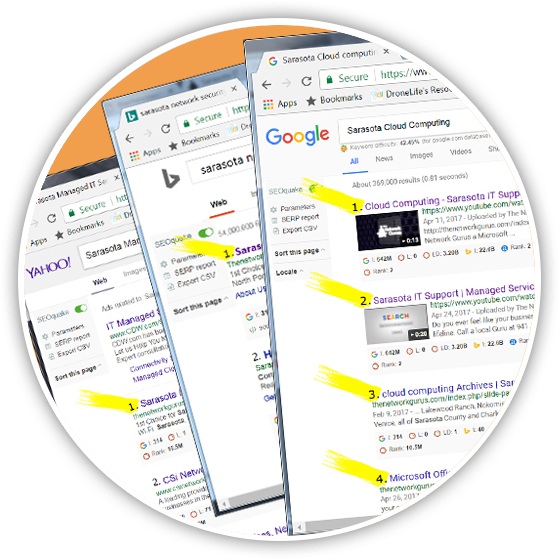 Ten of the top search engine position placements in Google, Ten of the top search engine position placements from Bing, and Ten of the top search engine position placements from Yahoo. Live and Verifiable SEO Results! = MULTIPLE PLACEMENTS on the Front Page.